Yesterday was a big one in college football with high schools players across the country decide which school they would not attend class at. The general consensus is that Vanderbilt, despite only signing 14 recruits (the SEC school with the next fewest signees was Georgia with 23), Coach Bobby's 2007 recruiting class is being heralded as one of "quality, not quantity." Coach Bobby was so efficient that his recruiting efforts for the football team, might also pay dividends for the Basketball team, as Jamie Graham is considering trying to walk-on to the Basketball team. Coach Stallings thinks Graham is capable of playing in the SEC and CBJ is not opposed to the idea either. Another recruit getting a lot of buzz is Alabama's Mr. Football Larry Smith, who, despite joining a Commodore team that is already carrying 3 quarterbacks, was "too good to pass up." Since I don't know anything, take this for what it's worth, but I would not be surprised to see Larry red-shirt a year. Nickson will be a junior next year and looks to be the quarterback of the Commies immediate future. If Smith were to red-shirt, he would have two years to learn the system and be in a very, very good position to take the reigns in three seasons as a red-shirt sophomore (just like Nickson did) with three years of eligibility left. QB is one of the few positions where the Commodores are deep and I would not be surprised if they don't try and milk the Alabama QBs for all they can. Moving to the world of Basketball. The Commies are ranked 23 in the AP Poll, not ranked in the Hosers’ Poll, and currently slated as a 6-seed in Joe Lunardi’s Bracketology. 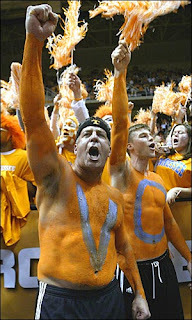 Conventional wisdom is that a win in Knoxville, and a sweep of the season series with BPB (Body Painting Bruce) and the Volunteers will move Vanderbilt from the “work left to do” to “in” column among teams looking to dance. Knock on wood, but I think Vanderbilt—barring a complete meltdown down the stretch—is in. Of their last seven regular season games, 4 are at home (South Carolina, Kentucky, Florida, and Arkansas) and 3 are against pretty mediocre opponents (@SC, SC, @MSU). If Vanderbilt can go 2-1 @ Tennessee and against Kentucky and Florida at home that puts them at 8 wins in conference. 8 wins going into a stretch run that includes games at Mississippi State and South Carolina and at home against South Carolina and Arkansas is a helluva position to be in for Kevin Stallings and the boys. Right now, Vanderbilt’s goal should be a second place finish in the SEC East and first-round bye in the SEC tournament. Tennessee and Kentucky’s stretch run are considerably more difficult, with Tennessee’s last 7 games coming against Vanderbilt, Kentucky, Alabama, and Florida at home, and traveling to Arkansas, South Carolina, and Georgia. BPB and his squad could very easily end the season 3-4, putting them 7-9 in conference. Of all the teams vying for the second spot in the east, Georgia’s road is the easiest. 3 of their last 5 are at home (Auburn, Mississippi State, and UT), with their other two remaining games coming at Ole Miss and at Rupp. Winning in Rupp is never easy, but unless they completely collapse, it is very conceivable Georgia ends the season winners of 4 of their last 5 with a 10-6 record in conference. Finally, there is Kentucky, whose win last Saturday in Fayetteville was impressive. They still have to play a home and home against the Gators, travel to Nashville, Knoxville, and Tuscaloosa, and play Georgia and LSU at home. That is, BY FAR, the most difficult stretch run of any of the teams battling for second in the East. Finally, while Kentucky currently holds a one-game edge over Vanderbilt with a 7-2 record in conference, if they don’t finish above .500 in their final 7 games, the Commies could very easily slide into that second slot…especially if Vanderbilt can sweep the season series thereby giving them the all important tie-breaker over Ashley’s Cats. Finally, Vanderbilt’s Baseball season starts tomorrow. This is something to get excited about since Vanderbilt enters the 2007 season as a pre-season Top 10 team. Baseball America has the Commies slated for a spot in the College World Series and Woody will have a complete season preview coming soon. While I don’t know much about college baseball, a friend of the blog by way of Cardinal Nation does, and keeps telling me how nasty Vandy Hardball will be this season. I hope he is right...I have heard Omaha is gorgeous in June. Hopefully this is the year the baseball team gets more coverage... other than of course the few of us parked behind the left field wall with couches drinking beers, grilling, and trash talking the opponent's left fielder. Go Dores, I look forward to Woody's report! Buster Olney for ESPN.com reports that Tampa Bay, who has the #1 pick in this years amateur draft, is very interested in making that pick David Price. "If the draft were today, Price likely would be the first pick."